Dryer vent duct cleaning reduces the risk of a dryer vent fire and improves the efficiency of the dryer, thereby lowering utility costs. Schedule for Only $69! Good insulation reduces unwanted cold air infiltration into the building and heat loss from the fabric and/or structure of the building. Get 10% Off Now! Save up to $2,000 in rebates when you purchase a new SEER 16+ air conditioning system! Reduce indoor allergens by scheduling your Intensive Air Duct Cleaning service today. Bad allergies? Excess pet hair? Improve indoor air with purifiers, electro filters and UV lights. Repair the damage to your home caused by flooding and leaking. 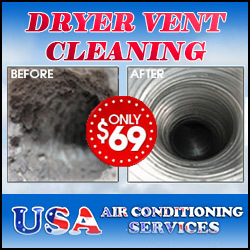 Improve the safety and efficiency of your dryer with affordable vent cleaning. High electric bill? Reduce energy costs with our quality AttiCat attic insulation installation. What is a SEER Seasonal Energy Efficiency Rating? A “seasonal energy efficiency rating,” also called a “SEER,” is a measure of an air conditioning system’s efficiency. By stating the average electricity consumption of an air conditioner during a typical “air conditioning season,” the SEER system allows consumers to more accurately estimate their energy usage than older rating systems allowed. A higher SEER indicates that an air conditioner uses less energy than those with a lower SEER. For its calculation, a SEER assumes an air conditioner will be in use 1,000 hours per year, which represents eight hours of usage per day for 125 days during the course of a year. Those living in more southerly locations will significantly exceed this, so a higher efficiency rating is even more beneficial. Additionally, larger houses require more energy to remain at a comfortably temperature and benefit more from high efficiency. The United States mandated that all new air conditioning units manufactured after 2005 be rated SEER 13 or higher. For an air conditioner to receive an ENERGY STAR certification, it must have a SEER of at least fourteen. Small window units have no such requirement and often have a SEER of around ten. Upgrading an existing air conditioning system to one with a higher efficiency rating yields significant savings; upgrading from a SEER 9 system, which was previously a common rating, to a SEER 13 system will reduce electricity consumption by a bit over 30 percent. Upgrading from SEER 9 to SEER 16 will reduce energy consumption by nearly 45 percent. While exact savings depends on several variables, most homeowners will see an electricity bill reduction measured in hundreds of dollars per year. To achieve a higher efficiency, manufacturers use thicker, more efficient metals in their air conditioners. Further, higher rated units generally have multiple compressors and larger coils. This raises the cost of the air conditioning system, so consumers must balance the cost of the unit with their expected energy savings. Most consumer guides recommend purchasing a system with a SEER of at least sixteen. Additionally, air conditioning units degrade over time. An old unit which had a SEER of nine when it was first installed may currently be operating at a lower SEER. Air conditioning units today tend to retain their rating longer, but it is worth noting that the more expensive materials used in more efficient systems can be expected to help maintain the unit’s rating longer than less efficient systems. And for those who seek to reduce their impact on the environment, a system with a higher efficiency rating helps reduce energy-related pollution. Systems with a higher SEER will also last longer and reduce the amount of material that ends up in a landfill. At one time, those looking to purchase a new air conditioner had no means to calculate the energy cost of their purchase; manufacturers had no incentive to focus on efficiency over cost. The SEER system has provided consumers with a valuable tool to calculate the true cost of their new air conditioner. This entry was posted in A/C Maintenance, Financing, Rebates & Savings and tagged energy savings, energy star, seasonal energy efficiency rating, seer by admin. Bookmark the permalink. Thank you for explaining this in terms I understand! I’ve never really understood and have just taken a sales person’s advice up until now. Now I can figure out for myself the level of efficiency I am looking at. Why is My A/C Leaking Water? "Your crew was a pleasure to have in our home. The work performed was done quietly, they cleaned up behind themselves and explained every aspect of the required service. We would not hesitate to suggest your firm to any of our neighbors whom are unhappy with the quality of the air in their home and admit that they have not had their ducts cleaned for some period of time." "It is my pleasure to write to you and let you know that I appreciated your company's service today. Both A/C technicians did such a great job, and they were very helpful! Their knowledge, professionalism, and thoroughness were apparent and I would certainly recommend them and USA Air to others. Thank you!" "These guys came out to my house a few days ago to fix my unit. To start off, they showed up right when they said they would. I liked using these guys so much i might just have them clean my air ducts next week. The guy had some very good points about dirty air ducts that have caused me to do some research." State Certified, Licensed, Bonded & Insured. License #CAC1813665 | Established in 1982. 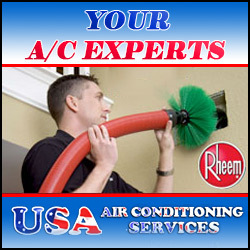 ©Copyright 2012 USA Air Conditioning Services, All Rights Reserved.